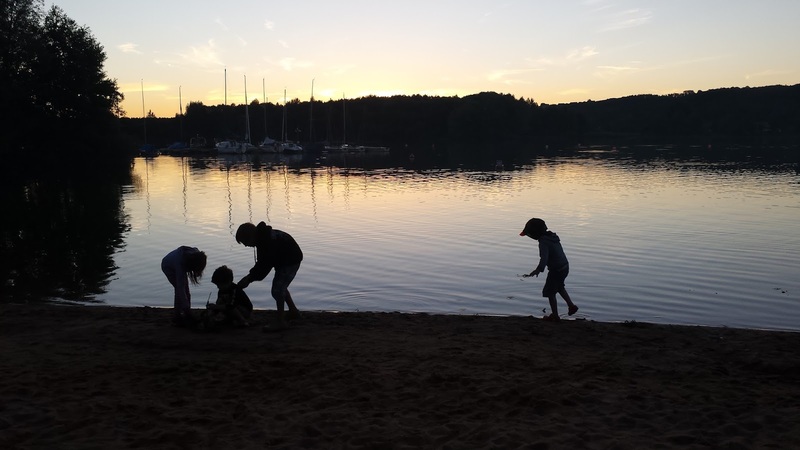 We recently returned from our second family camping holiday. It was our first with all three of the boys and it was a great success. b) he wanted to do some fishing while we were there. 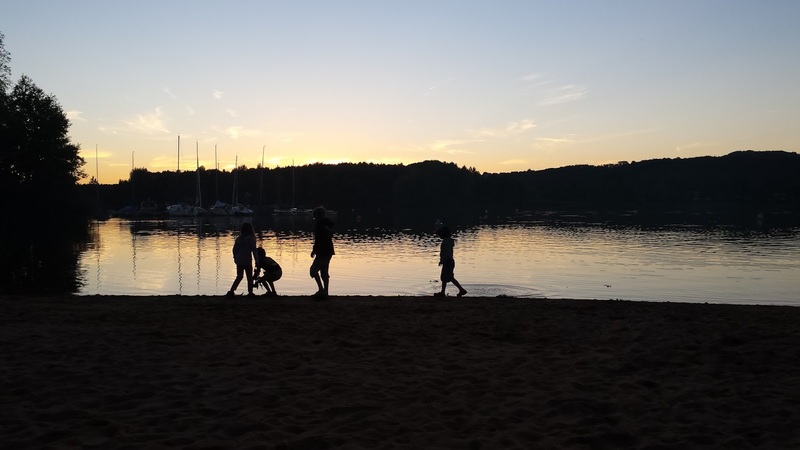 In the end he chose See* Camping Langlau, a campsite directly on the Small Brombach Lake in the Frankonian Lake District, not too far from Nuremberg, approximately a 2 hour drive from Munich and 3 hours from Karlsruhe. *See is the German word for lake. On Friday afternoon as soon as school finished up, we headed off, having loaded up the car in the morning. Thankfully traffic was reasonably good and the children too excited about the prospect of sleeping in a tent to argue much. We stopped for a break after a couple of hours, the heat having got to us all a bit. Everything but the kitchen sink, as they say. Our view as we devoured chips and stretched our legs before continuing our journey. After a stop at the local fishing shop to top up on tackle and find out what works best when for which fish (or if you are me, after a 35-minute aimless wander round a fishing shop trying to entertain three children and keep them from breaking expensive sunglasses and binoculars), we finally reached the campsite, checked in and began to set up camp. This is when we realised that a canoe makes an excellent playpen. We are by no means seasoned campers. 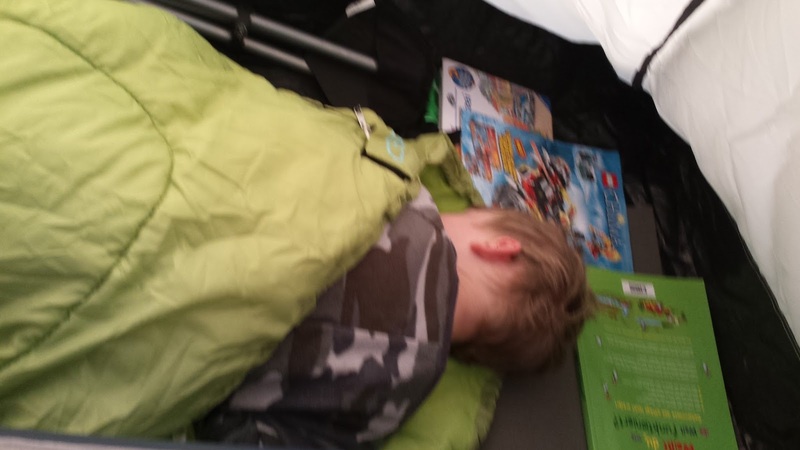 Our tent has only had three outings, the first of which was in our garden. But we have good intentions and our levels of skill and organisation have increased from trip to trip. This time round, we had the tent up quite quickly. As the Bavarian and our friend set it up, the boys and I got to work unloading the roll-table, the fold-up chairs, the rucksacks and cool boxes. I had put quite a bit of thought into the food for the weekend. With camping I am torn between cooking food outdoors and bringing food that just needs heating up or can be eaten cold. Both have their ups and downs. In the end we opted for a combination. We brought ready cooked pulled pork for Friday night and we had a barbecue on Saturday night (buying the meat locally on Saturday, the fishing expedition having proved unsuccessful in terms of catching). I made a couple of cakes (a banana-chocolate chip tray bake and an iced lemon loaf) that would do us just as well for breakfast as they would for with a coffee later in the day for a snack for the children. Both the cakes and the pulled pork went down a treat. The campsite shop sold fresh bread rolls in the mornings and we made coffee on our one-ring electric cooker (a bit of a cheat but the fishing shop had run out of gas canisters for the gas cooker). Banana chocolate chip tray bake,squeezed into a lunch box. My slow cooked pork joint, reheating in the marinade, ready for pulling and scoffing. After we had set up camp and eaten our fill of pulled pork, salad and rolls, we set off at the onset of twilight to explore the lake shore. On booking we had requested tent spots near the lake and the ones we got were prefect. In less than a minute’s walk we were at the small sandy beach of the lake. The four older children headed straight for the water and busied themselves with building a dam. The silouette of their playing was magical to watch and certainly put me in a holiday mood. Our walk over, we put the children to bed. Within minutes all five were sound asleep. My concerns about Number Three not settling vanished when I saw how comfy he was in my sleeping bag with this brothers in theirs on either side of him. The adults returned to the camping chairs and made plans the following morning – fishing (the men) and beach (women and children). A quick bit of exploring in the tent before falling sound asleep. The rest of the weekend was an incredibly enjoyable, relaxed affair with plenty of sun, splashing, fresh air, good food, and a fair bit of fishing. 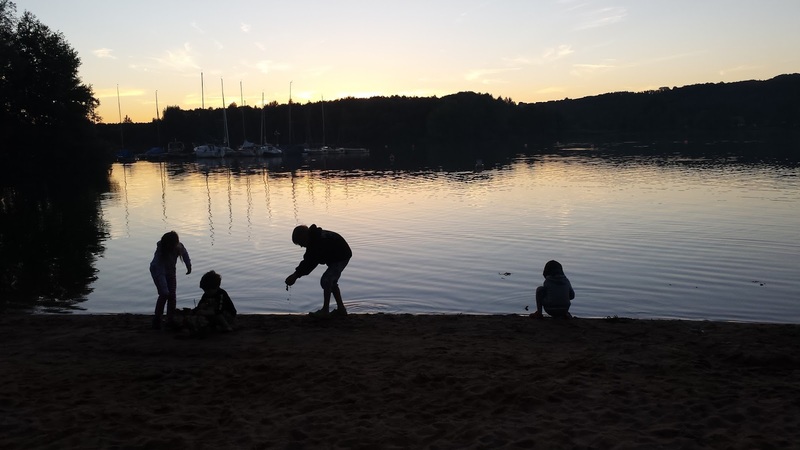 We didn’t have to leave the campsite all weekend and barely used the fantasic playground, so busy were we with the beach, the canoe and the fishing. Sailboats on the lake on Saturday morning. Suncream on the lens created this dreamy look of my boys playing on the beach. For our two-night stay, each family paid approx. €60. That covered the two nights’ tent spot, the car, two adults and two children over 3 each. The campsite was clean and quiet, the washrooms regularly serviced with no need to queue for showers or toilets and the shop sold everything we needed. In addition to the playground, there is a surf-school and a reasonably-priced Italian restaurant on site. We ate at the restaurant on Sunday afternoon before heading for home and were quite impressed with the food. By the end of the weekend, I was left with a feeling of “why don’t we do this more often?” and I have a feeling that now we will. 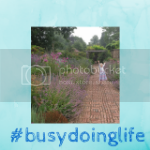 Thankyou so much for linking up with #busydoinglife. Such beautiful pictures and memories to treasure! 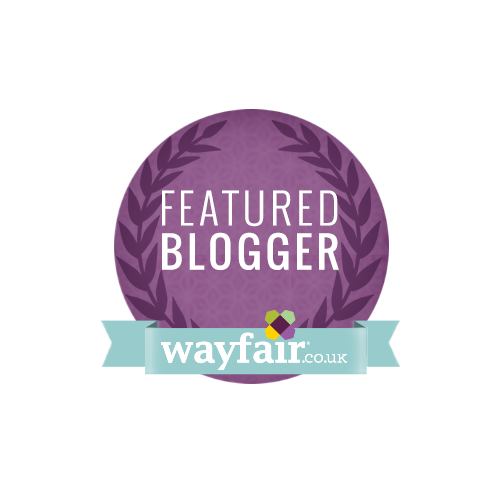 That slow roasted pork is genious! We often pop ajoint in the aga but have never thought of taking it with me somewhere to reheat! The hubby will be very impressed, Thankyou! It was great. My husband, The Bavarian, is very outdoorsy and we want the boys to be too. Well they are really now I suppose. Anyway, camping with two worked well so we gave camping with three a go and had a blast. I side with the boy scouts' motto “be prepared”. Aw, thank you Claire! The Bavarian is a big meat eater (most Bavarians actually), so I thought a roast would be good – warm or cold, with rolls and salad. It was really easy to transport. I wrapped the joint in tinfoil to keep the heat in and filled the gravy into a large jam jar. Give it a go.